It’s a sun-drenched morning as I stand at a lookout point above the town of Mijas. Below me, the gleaming white buildings, with their roofs of rust-red tile, tumble down the mountainside. The pine-covered hills of the Sierra de Mijas mountain range reach up into the clear sky to my right. On my left, I can see the Costa del Sol—the Sun Coast—with the glittering Mediterranean Sea stretching to the horizon. It’s a comfortable 66 F here in Mijas, which is located in southernmost Spain. With more than 2,800 hours of sunshine a year around these parts, it’s the perfect place to escape a harsh winter back home. And it’s affordable. A couple can live well for about $2,400 a month, including $600 in rent. You can own your own little piece of romantic Spain for less than $110,000. If you’re looking for a full- or part-time escape, complete with all the romance of the Old World, then look no further than Mijas and its sister mountain towns in Andalusia. This part of Spain is already a popular snowbird destination for Europeans. Just a short drive away from pretty towns like Mijas is the hustle and bustle of the Costa del Sol. But up here, life is slow, unhurried, and more authentic. Over the years, Mijas has drawn the creative set to its hilltop. Bright store windows offer handcrafted silver jewelry inlaid with gemstones and intricately made glass bowls in various colors. That’s good news if you like the idea of living here. There’s a good choice of rentals at affordable prices. And, despite the return of the European snowbirds, there are still plenty of great-value properties for sale. I came across a two-bedroom, one-bathroom apartment right in town for €85,000 ($107,950). Living here puts you close to all the stores, and the apartment also has a private patio area, perfect for enjoying the year-round sun. Also in the center of town is a penthouse apartment with two bedrooms and a balcony, with views of the village and the sea in the distance, listed for €99,000 ($125,730). On the edge of Mijas, a one-bedroom, one-bathroom, furnished apartment, with a communal pool and gardens, can be yours to rent for just €450 ($561) a month. It also has a terrace with views to the village and the coast beyond. If you want to be right in the village, I found a two-bedroom, two-bathroom, fully furnished apartment in the center of town for €500 ($624) a month. If you’d like a town that’s more Spanish and less international, then about a 30-minute drive west of Mijas is the unassuming little town of Ojén. Another of Andalusia’s white towns, Ojén has a small-town vibe and is quieter than Mijas. It’s sandwiched between the Blanca and Alpujata mountain ranges, clinging to the verdant green Andalusian hills. With its tiered, narrow, cobblestone streets, the town’s signature white buildings almost look as though they’re piggybacking one another. The town’s name comes from an Arabic word meaning a rough or bitter place. But when you stand in the old town, it’s hard to believe that this place was ever that way. Ojén has a “real” Spanish-town feel to it. It’s peaceful here in the mid-afternoon, as shops close for the traditional siesta. You’ll hear the clink of coffee cups coming from the tiny cafés, as the locals relax during the afternoon. An occasional car squeezes past on one of the slim, steep streets. In the distance, the excited chatter of school children can be heard, as they’re released from their day’s classes. The pace of life up here is slow and steady. Finding rentals in Ojén isn’t easy. This is a small town and doesn’t have much of an expat presence. But I did find a two-bedroom, two-bathroom apartment in the upper town, with a terrace that boasts views of the village below and the Marbella coast in the distance. (The glitzy resort town is just a 15-minute drive down the hill.) The apartment rents for €500 ($635) a month. This same apartment is also for sale, with an asking price of €160,000 ($203,200). I also came across a two-bedroom, one-bathroom apartment that has a fully fitted kitchen, marble floors in the living area, and underground parking for €88,000 ($111,760). This would make a great holiday or long-term rental. Both Mijas and Ojén are close to the coast and the resort town of Marbella. If you need a dose of “big-town” activity or fancy a dip in the Mediterranean, it’s less than a 30-minute drive away. A bustling town of around 140,000, Marbella has everything you could want as an expat…big-name grocery stores, a glut of restaurants and cafés, clothing stores from upscale Gucci to mainstream Zara, and a hospital. Real estate in Marbella is more expensive than up in the mountains. This is where the European élite decamp for their fix of fun in the sun. But it’s still affordable. Properties for sale start at around €139,000 ($176,530) for a one-bedroom, one-bathroom apartment about a 10-minute walk from the beach and promenade. Closer to the water (a block away) I found a one-bedroom, one-bathroom apartment for €210,000 ($266,700). Long-term rentals are affordable, too, for a high-end resort town. I saw a furnished, one-bedroom, one-bathroom condo, with 538 square feet of living space, with views of the promenade and beach from a covered terrace, which rents for €800 ($998) a month. If you want something a bit bigger and don’t mind a 10-minute walk to the beach, a two-bedroom apartment with one bathroom in 753 square feet, with a shared pool and garden, is renting for €1,000 ($1,247) a month. If you like the idea of living in one of these alluring mountain towns but want to be even closer to the beach, then Torrox ticks all these boxes. 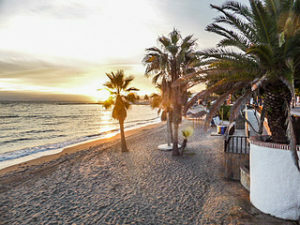 This peaceful pueblo is located 40 minutes east of Málaga and about an hour from Marbella. It’s also less than a 10-minute drive from the beach of Ferrara Playa. It offers great-value real estate, with townhouses from €80,000 ($101,600) and long-term rentals from as low as €375 ($480) a month. 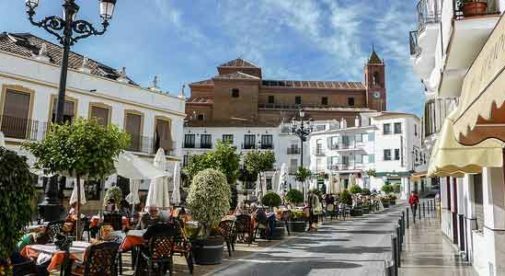 In the heart of town, Plaza de la Constitución is a fabulously elegant square that’s home to Torrox’s town hall and a handful of outdoor cafés. Rising up behind the town hall is a terracotta-colored church with a striped yellow-and-green bell tower roof, standing in stark contrast to the gleaming white village it overlooks. A three-bedroom townhouse in the village is currently on the market for €80,000 ($101,600). Located on the main square, this traditional, white-washed house also has a bathroom, a large living room, and a spacious terrace with views of the surrounding hills. If your budget stretches a little further, for €118,000 ($149,860) you can get another white house that was recently renovated. This one has living space over three floors, with two bedrooms, a bathroom, an open-plan kitchen/dining room, and two roof terraces (one covered) with mountain and village views. If you want to spend only part of the year living in Torrox, and you’d like your house to earn you a little extra cash when you’re not there, consider turning it into a vacation rental. While long-term rentals are plentiful here, vacation rentals are scarce. And this is a town that’s a pleasure to spend time in…even for a week or two. I found a three-bedroom townhouse, for instance, that rents for €350 ($436) a week in low season and €550 ($686) in high season. In the village center, a long-term rental is going for €390 ($495) a month. The apartment has three bedrooms, two bathrooms, and beautiful views from all the rooms, as they all open onto one of two terraces—one of which faces the ocean and the other, the village itself. Living in Torrox would give you the best of both worlds…the romance and intrigue of a Moorish town, but still just minutes from the coast and all the amenities you’d need for everyday living. I’d happily live here, and the good-value real estate prices make it all the more tempting. Most North American visitors to Spain gravitate to Madrid, Barcelona, and possibly Andalucia’s Moorish Triangle: Seville, Córdoba, and Granada. Relatively few come to Valencia, Spain’s third-largest city and a major business center. And that’s too bad, because this is a great city. For tourists, Valencia offers a mild, Mediterranean climate, urban beaches, plenty of culture, and that large historic center to wander. And if you’re looking for a place in Europe to call home, whether full- or part-time, you’ll find in Valencia all the First-World lifestyle, urban amenities, and real estate you could want…and costing a fraction of what you’d pay in Madrid or Barcelona. And right now this city is a particular bargain: Hard hit by the recession, Valencia offers low rates on everything from real estate to menús del día, Spain’s fixed-price lunch. Outside the hottest months of July and August when the temperature can hit the upper 80s° F, Valencia’s climate is famously mild. Daytime winter temperatures average in the low 60s° F—I’ve strolled the city in February in only a light linen jacket—and a full eight months of the year enjoy summery, short-sleeves weather. Valencia lies smack in the middle of Spain’s Mediterranean coastline, just over 200 miles south of Barcelona and about 80 miles north of Alicante. It also has long stretches of beach right in the city—you can take a bus or the metro there. Seaside restaurants and small hotels line the beachfront, and palm trees are everywhere, leaving no doubt that you’re in a warm-weather climate. The city is also very green. There are numerous parks. A great swath of greenway runs from northwest to southeast, in a long curve right through the middle of the city, all the way to the sea.